This chapter describes an investigation of strategies for fostering higher order cognition in a blended learning environment. The exploration, which utilised a qualitative case study approach, highlights the critical nature of effective instructional design. The study extends the educator’s understanding of the complexities of online and blended learning environments through an analysis of the discourse of computer-mediated communication in a first year teacher education course. The investigation resulted in the development of a pedagogical framework which outlines the relationship between pedagogies, technologies and their related learning outcomes. Critical indicators, which are potentially important as strategies and early warning signs of “students at risk”, become evident in the analysis. This research had led to notions of imprinting and cognitive tracks which can be used to inform strategies for teaching and learning using a blended approach. Education has undergone a dramatic transformation in recent years. This is evident in both the beliefs about how students learn and the type of technologies that are evolving and are available to support and enhance student learning. Higher education has undergone many modifications with the foundations of universities shaken by new and emerging Internet technologies and by increased numbers and diversity in the student population and demands for new learning approaches that will provide learners with flexible and personalised learning. There is a need to rethink and restructure learning experiences and explore the transformational potential of a blended learning approach. Blended learning is a popular term which is used in the literature to describe a wide variety of teaching and learning strategies, but as Garrison and Kanuka (2004) suggest, understanding blended learning involves both the simple and the complex. They explain that in its simplest form, it is a combination of face to face learning with online experiences, integrating synchronous (classroom) and asynchronous (text-based) activities. On the other hand, there is complexity in the integration of deliberate, effective and innovative design implementations that can support deep and meaningful learning. Information and communication technologies (ICT) have provided tools which offer limitless design possibilities and applications (Garrison & Kanuka, 2004). The effectiveness of blended learning approaches will be in the merging of the design components which are essentially synchronous and asynchronous, face to face and online. There is now the opportunity to enhance learning through a focus on two main forms of communication – oral and written, while improving the effectiveness of each form. Take into account the type of interactive activity, the use of appropriate technologies and their potential to achieve desired learning outcomes? 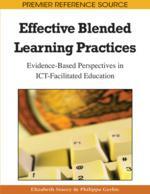 Support the development of critical thinking in blended learning environments? Based on the research study and the literature, a pedagogical framework was developed to help inform effective blended learning practices. In addition to this, the study aimed to identify factors that drove students’ approaches to learning and the development of new concepts for explaining the learning processes and their resultant impact on the instructional design. It investigated the research potential of digital archives for assessing the quality of the learning in a blended learning environment. Constructivism provides a theoretical basis for explaining how students learn and the consequential principles that guide the instructional design in the development of higher order cognition in blended learning environments. The focus shifts to the acquisition of knowledge rather than its transmission. The popularity of constructivism in the teaching and research literature has resulted in disparities among educators who often have their own interpretation of terms leading to individual variations in meaning. Despite numerous constructivist perspectives, a common thread is the belief that learning is an active process, unique to the individual, where knowledge is constructed from information and prior experiences (Cooper, 2004).